How does it happen that with less than a month’s notice, your favourite band in the world is coming to town? Sure, it’s one of the best surprises that will make your day, but on an international scale, very few large-scale gigs and festivals are announced with just a month’s notice. It’s been happening far too often in India, and the victim is the attendee. It’s no surprise, then, that people complain about low turnout for shows – whether they are open-air festivals or club shows with a big name attached. As a reporter, one of the first things you’re asked when you’re writing a gig review or festival report is the turn-out. This is one often one of the trickiest things to estimate – and you can’t always take the word of organisers or PR firms when it comes to putting a number on it. Turn out is one of the most important indicators of a festival or big-name gig’s success. Sure, the production can be top-notched and the crowd can feel comfortable at the venue, but even artists will always mention the attendance in terms of bad, low, decent, great or packed. It’s also very risky for a gig organiser to estimate how many people will turn up. Part of that is their responsibility – if they plan and announce shows and headline artists well in advance (like every other major festival in the world), they have a better shot at selling tickets and of course, building a loyal following. 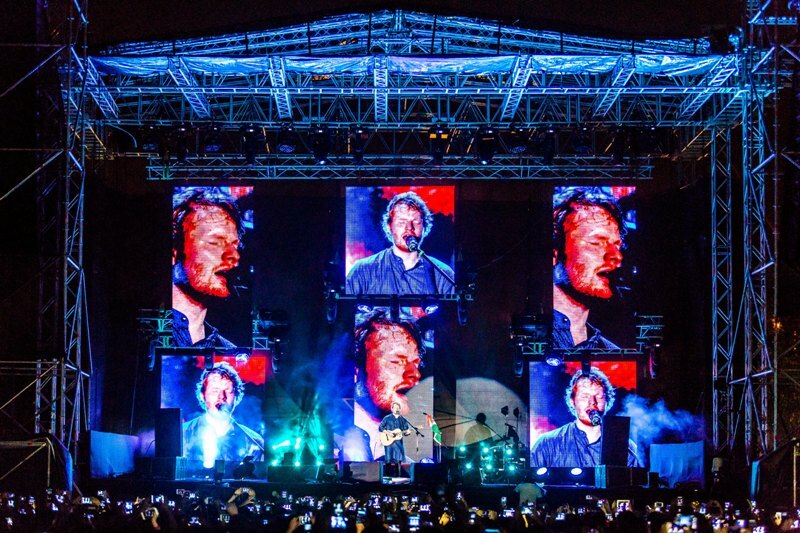 A look back at March itself can tell us how three international artists’ gigs were promoted in India – pop star Ed Sheeran, alt rockers Switchfoot and Brit alternative/experimental group Alt-J. It’s fair to say these are better examples of how the names were big enough to bank on. Alt-J’s appearance at arts and music festival Emerge on 28 February in Bengaluru apparently sold over 5000 tickets, and although their Gurgaon show was jinxed by unseasonal rain, it’s no surprise to hear organisers are trying to bring them back to the country. Switchfoot, a band mostly known to have a bit of nostalgia value for their early 2000s hits such as Dare You To Move and Meant to Live, packed in the Hard Rock Cafes across Mumbai, Pune and Gurgaon in the last week of March. But I’d like to specifically mention Ed Sheeran separately because he was performing at the FLY Festival in Mumbai, organised by Percept, who are chiefly in charge of Sunburn Festival in Goa. For those not in the know, or vaguely trying to recollect where they’ve heard of FLY Festival before – this was the festival that was slated to take place in February 2013, hosting the biggest names in rock and metal in India – from Limp Bizkit to Mastodon and Anthrax as well as Ray Manzarek and Robby Krieger – that was cancelled a week ahead of kick-off. Clearly undeterred by the dented reputation, FLY hobbled back to the front in January end, raising the flag of Ed Sheeran. They’d lost credibility, but FLY gained it back with Sheeran’s massive, two-hour-long, one-man show in Mumbai on the 1st March. By most estimates, over 5000 people were present at Mahalaxmi Race Course, with a few even quoting a turnout of ten thousand fans singing along with Sheeran. You can only imagine the turnout if FLY festival had taken off the ground in its original run in 2013. Ironically, Percept was reported to have cancelled FLY after getting a lukewarm response to ticket sales. One of the biggest concert turnouts for an international band that year, however, belonged to America rockers Hoobastank, when they played in Shillong, tickets on sale with less than a month’s notice. But since the tickets were cheap (Rs. 500), Shillong showed up in large numbers of over 5000 for Hoobastank. It’s a no-brainer that events need a lot of advance ticket sales just so that they can break even, let alone make a profit. Mumbai-based annual music event Johnnie Walker – The Journey seems to have found a perfect way out. While their inaugural 2013 edition featured Alan Parsons Live Project, the next year, they buckled up and announced electronic artist Bonobo and Grammy-winning jam/jazz band Snarky Puppy to headline the event. They sold out tickets before the show, which saw over 2000 people in attendance. Sometimes, a lot of planning in advance might not help at all. This is often the case with club shows, who are often stuck with weekday tour dates for international artists like Lee Ranaldo and the Dust in 2013. For someone coming from the US, a member of path-breaking band Sonic Youth, Ranaldo must have performed to about 50 people at Mumbai’s Blue Frog in September 2013. Bangalore Open Air, one of India’s first metal festivals, ended up bringing in about 2000 fans in its 2013 edition, which featured heavy hitters such as Iced Earth, Animals As Leaders and Dark Tranquillity. But even that turnout is not enough for the scale of which the event was planned. It was no surprise to find the organisers scaled down the event considerably in 2014, placing bets on a club venue like CounterCulture, which can, at most, accommodate 1,000 people. They’ve regained their confidence now, though, and return with an open-air version of BOA with extreme metal headliners such as Napalm Death and Inquisition in June this year. They’ve learnt that for festivals, it’s about building a loyal following. The likes of NH7 Weekender and SulaFest continue to enjoy unwavering attendance because they’ve been at it for so long, delivering quality music for all kinds of music fans. Earlier this week, music channel Pepsi MTV Indies entered the fray with their first festival edition of Spiro, headlined by critically-acclaimed, Grammy-nominated electronic/hip hop producer Pretty Lights and the Glitch Mob performing on April 4 at Mehboob Studios in Mumbai. The organisers made a good bet on Pretty Lights, who has gained quite a following in India among electronica/hip hop lovers, and drew over 1500 people. Up this month is CultFest, another new festival that aims to capitulate on metal followers across the country, with headline acts including death metal legends Cannibal Corpse and modern death metal/deathcore band Suicide Silence performing on 11 April.